As small-balance borrowers and note-holders alike know all too well, hundreds of billions of dollars worth of commercial mortgages are slated to mature over the coming few years in a finance marketplace that's become far less liquid than was the case through 2007. Hence, one critical question looming today in the small-balance commercial finance arena is: Will Wall Street investors once again green-light securitization of sub-$5 million mortgages as they did with such gusto earlier in the decade? But as is painfully obvious today even as CMBS issuance continues to recover from its spectacular decline: that question is yet to be answered. Yes, Wall Street conduit programs are picking up the lending pace from the microscopic levels seen over the past couple years. 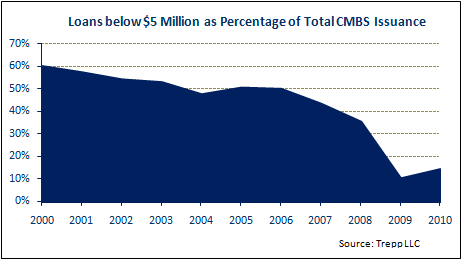 As many readers will recall, CMBS issuance nearly ceased altogether after peaking at more than $230 billion in 2007. Various analysts predicted at a recent industry gathering that issuance should approach $15 billion this year and perhaps $35 billion in 2011. Unfortunately, however, the pools of securitized mortgages going to market these days include very few small-balance loans - in sharp contrast to the boom years when typically half the pooled loans were $5 million and under. According to data that CMBS analytics specialist Trepp LLC crunched exclusively for SmallBalance.com, loans of $5 million and under accounted for almost half of all loans originated for securitization during 2005 (when lenders originated 12,737 conduit loans), and 2006 (when conduit loan originations totaled 14,404). Even among 2007's 11,200 new conduit loans, small-balance transactions accounted for nearly 44 percent of the total. So we're talking about nearly 18,500 small-balance loans originated for securitization during those three years. However, small-balance origination for securitization has fallen even more dramatically than conduit lending generally since those times. Lenders originated a total of barely 60 small-balance loans for securitization in the 2008-09 biennium, rebounding to all of 53 of the 370 loans originated for securitization so far this year. That's just 14 percent small-balance, compared to barely 10 percent last year. The problems for small-balance borrowers facing maturities is that today's few active conduit lenders are focusing mostly on Class A "trophy-like" properties in major metros, explains Trepp vice president Paul Mancuso. What they're tending to avoid are "secondary and tertiary property types in locations outside of prime geographic locations," he continues. And unfortunately, as Mancuso observes, the bulk of small-balance borrowing needs aren't within the quality and location parameters to which conduits have limited themselves of late. Nor is Mancuso particularly optimistic that conduit lending will start embracing small-balance deals next year, as strict underwriting standards will most likely continue to rule the day. Nevertheless, we're seeing at least a few signs that conduit lenders are likely to demonstrate greater interest in small-balance transactions a bit further down the road. As measured by the Mortgage Bankers Association's originations index, conduits and other lenders are becoming more and more active. The conduit portion of the index, while still quite low by historic standards, jumped by more than 45 percent from this year's second to third quarters - and 800 percent over the year-earlier score. Perhaps even more encouraging for small-balance borrowers, JPMorgan Chase is one of today's most active conduit loan originators - after inheriting the platform of perennial small-balance lending leader Washington Mutual. 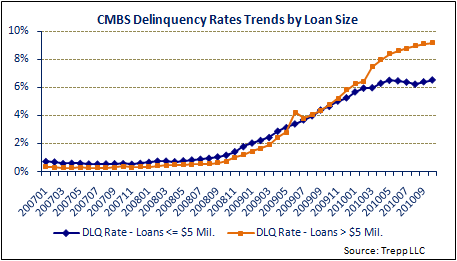 Also, now that conduit loan delinquencies appear to have peaked for the cycle, it's clear that small-balance loans are performing significantly better than their $5 million-plus counterparts - at least for the past five calendar quarters or so. According to Trepp data, the October delinquency rate (6.54 percent) for small-balance conduit loans is 264 basis points better than the rate (9.18 percent) for securitized loans with balances of $5 million or more. That factors to about $4.3 billion in delinquent small-balance conduit mortgages, out of about $66.4 billion in small-balance securitized mortgages outstanding today (a figure that's actually down from the peak exceeding $90 billion three years ago). Likewise, it seems logical to think that risks associated with the substantial concentrations of very large loans securitized through the latest CMBS issues will eventually prompt bond-buyers to push for more loan-size diversification, i.e., to include more small-balance loans in CMBS pools. To wit, all of the latest conduit CMBS issues can be described as especially "lumpy" based on standards seen when giant deals went to market regularly back in the middle of the decade. In other words, each deal's 10 largest loans represent more than 55 percent of the principal balance of all the loans - with some closer to 75 percent. For now CMBS investors, attracted by the favorable yields, have not been exceptionally choosy when it comes to pool diversification. Small-balance originators hope investor preferences change next year.